Tuesday, 31 March. It’s the first of what will be many milestones I suspect and not just because it’s the end of the first week in autumn. It’s a week since the leg brace came off – seven weeks since surgery. Leg was still pretty swollen. Wish it would start to go down. Too sore to go into work. Managed to get out of bed and make it down to the MGS physio to see Dave Sheppard. He worked me really hard and it hurt a bit when he was flexing my knee. At the end I had good range – about 125° compared to a maximum 115° last week. Last week was the first day of physio out of the brace and he seemed very pleased. He gave me the all clear to get the remediation underway. 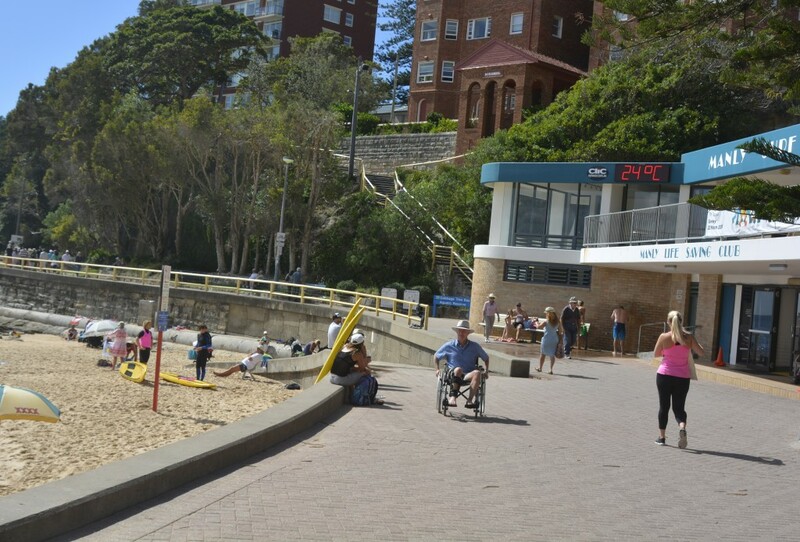 I managed to walk all the way down to Manly and back, virtually carrying the crutches. Dave said I could dispense with them now if I felt I didn’t need them. After lunch, Seaforth Pharmacy came to pick up the wheelchair. Saw it depart about 3 o’clock for the last time. I felt kind of sad watching them load it onto the truck. Have been in a wheelchair for nine weeks starting in Canada. Travelled through airports in one, attended a wedding in a wheelchair, showered in one and did numerous laps up and down Manly beachfront in one. A time of great self-discovery and appreciation of the difficulties of others. That is now at an end. No more crutches either. Starting to feel like I’m returning to normal. This morning was the first time I had a shower without leaning on the crutches. I inadvertently left them in the shower and couldn’t find them afterwards. I guess it’s a sign confidence is returning. At swimming this afternoon, didn’t bother to take the crutches with me. Had to park my car a long way from the pool. Walked from the carpark to the pool and back without any difficulty, although I have a limp. I did 20 laps using a new central snorkel which lessens the rotations and might give my shoulders a break. Shoulders now sorer than my leg, which is very disappointing. The beginning is now over. I guess this is the start of the middle bit, where it becomes slow drudgery. Start gym rehab work tomorrow. Monday morning and my leg still very swollen, stiff and sore. Went to work and joined the Virgin Gym at lunchtime to get exercise programme underway. I hate gyms. Met a personal trainer called Belinda Van De Ven. A kiwi physiotherapist working over here. Has had a lot of experience in post-surgical rehab. Seems a competent girl. Had a go on a stationary bicycle and managed to get the pedals rolling all the way round, which I couldn’t at home. She guided me through this. I think I’ll be able to do the bicycle as long as I don’t put too much pressure on my leg. I’m paying a big price for not icing and raising my leg straight after surgery, although I’m sure I’ve got a DVT. Maybe it’s just because I did too much. Anyway it’s very depressing. Very! Marg Carney picked me up and drove me to work this morning after the Monday Manly swim which I can’t do yet. I didn’t get the carer as the cleaners came today. Trying to juggle all these helpers is hard. Had to drop off a pile of shirts at Spofforth street to be ironed on way to work. I will probably send the other wheel chair back tomorrow. Don’t need it now. I have not taken any blood thinners for a week since I had the brace off and started walking. I hope it was the right thing to do. If I have a DVT it clearly wasn’t. Bad day. Must have overdone it over the last couple of days. My leg is very swollen. 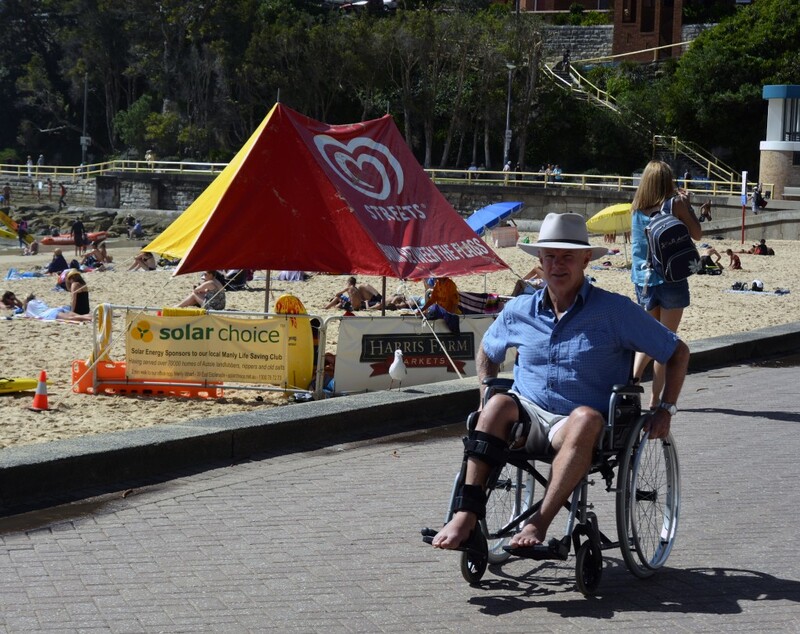 I went down to the Balmoral Beach club this morning for the second time since I injured myself. Rob Boylan very kindly picked me up in his liitle smart car which sounds like a sewing machine. 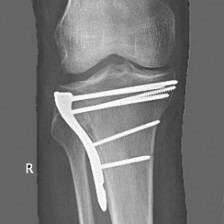 Ian Meakin, the orthopaedic surgeon, who is also a swimmer, had a look at my leg. I told him I think I’ve got a clot in the calf. He thought I didn’t have a DVT but conceded it is very swollen and it’s very painful. I didn’t walk today. Had a sleep in the afternoon and then went and did some laps in Manly pool. Only 20 laps this time. Called in to see my daughter Catherine, who is very miserable after getting the plate removed following her tibial plateau fracture. I hate seeing her in such pain, but she seemed a bit better than previously. It is times like this when I see Catherine in so much distress that I regret exposing my children to skiing. Nevertheless, she has been skiing since she was about 5 years old so she’s had a dream run. My shoulders are still very sore from the wheelchair. I’ve overdone it there and it’s preventing me from swimming. Feel pretty miserable and my whole body feels broken. I’m sure I’ve got a DVT. Catherine’s ice cuff and the tube going to the electric pump. This is the most efficient way to keep the wound iced. The pump keeps cold water continually circulating through the cuff, cooling the wound and helping to minimise swelling. We purchased this pump and cuff from the hospital in Utah, where Catherine’s surgery was performed and brought it back to Australia with us. 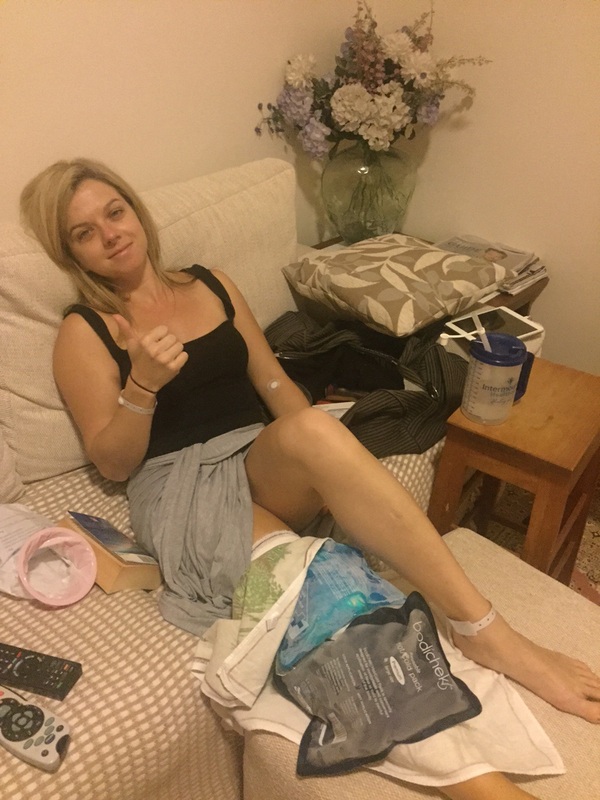 And so two years after suffering a tibial plateau fracture in the same leg as me and getting a plate and screws same as me, Catherine had her plate out today. I hear the operation went well and she has gone home to her mother this evening. I would love to go and see her but she is too sick apparently and in a lot of pain. Full of painkillers again and feeling miserable. Matt Lyons, my surgeon took the plate out. I suggested Catherine try for a 2 for the price of 1 deal but she didn’t want to buy into that. I would have had a go. She must have too much money. He also had to clean up her meniscus which was damaged from the accident. The torn meniscus is what was causing her pain when we skied in Japan. It should now be ok. I’m lucky in that I don’t seem to have damaged the meniscus at least as far as I know. I hope that’s it for her. She has been very disciplined and determined over the past two years. She needs some good news now. I thought they were only joking but apparently there is a huge pile of metal and screws in my knee. Today was the end of the beginning for me – six weeks since surgery and the moment of truth when they x ray the joint and tell you if the articular surface is once again intact ie you can or can’t start walking again. I went into the doctor’s surgery on crutches with the brace on; left with the brace in the bag. No more brace. I walked on two legs for the first time in 2 months. The last place I walked to was the base of the cable car in Revelstoke. Seems a long time ago. My trusted driver and radiology consultant Jon Attwater picked me up from the Mater and deposited me at my apartment. After fixing a classic Simpson Desert degustation sandwich (without pickles) he chauffeured me to Manly Pool. This was like coming home. All our kids learned to swim there .. Narelle Simpson was still coaching by the side of the pool and I haven’t been back for about 15 years. It was pouring rain and one of the pool attendants helped me in – sitting down. 30 laps later and I was feeling like a new man. The effortless rhythm and flawless stroke was still there! Hardly. I think I was channelling a young Murray Rose (Maybe only in my mind) Jan and Denise be afraid…be very afraid! There is nothing like swimming after a long break on a thundery day, in a deserted pool with the rain pelting into your back. It was magic. I also found I could walk half way up the pool and back without hanging onto anything and it made my leg feel alive again. I can sleep tonight without a leg brace on for the first time in 9 weeks. I would like to go out and have a drink but I don’t drink so I celebrated by coming home after the swim and eating half a packet of chocolate coated peanuts. I didn’t feel a bit guilty. Don’t tell Alison. Well Barry. .. the Palm Beach to Manly swim is only 8 months away and I need you to get fit. Into the pool with you mate and begin to shake off the lazy trainer tag. It was Friday 13 today. That is usually a bad day. Yesterday was one month since surgery. What a long time it seems. Awoke this morning at 5:30AM. Boy that was tough. Had a shower and was out the front for Bob Johnson to pick me up at 6.30am. I can’t drive. Really cold morning, the first cold morning this year. I had to go to a strategy meeting for the Balmoral Beach club at 830am. That is my swimming club on the harbour in Sydney. I got down to the club about 7 AM and decided to go in and say hello to everyone in the men’s change room. This was my first visit to the inner sanctum since the middle of January before I left for Canada. New boilers have been installed in the shower room with a promise that they would never go cold, no matter how bitter the winter is. We’ll see. Other than that it all seemed the same. It had a nostalgic sense of normalcy for me. What my life was like before I broke my leg. A lot of people seemed genuinely pleased to see me back and were very interested in what had happened in Canada. Barry Feyder drove me home after our strategy meeting at Awaba Cafe. We had a cup of tea in my apartment and talked about many of the pressing issues in our lives. Had a good hit out on the crutches today. Went about halfway to Manly and back. My shoulders are still pretty sore but not as bad as yesterday. Marg Carney came over to check up on me. She ended up cooking dinner and we watched the Friday night Rugby League and talked. I love the company. It banishes the blues. A bight autumn Thursday morning. I had breakfast with client and friend, Andrew McDonald who is down from the country. I enjoy his company has he has a very inquiring mind. Once again at Jellyfish. I am certainly getting to know the Manly haunts. Rolled back to the house after breakfast and realised I didn’t have my wallet. Turned around, crossed the level crossing and was proceeding down the footpath to Jellyfish when I happened to see a girl walking by holding something that looked like my wallet. I stopped and asked her if she had just found it. She said she had found it lying on the footpath and was wondering what to do with it. She gave it back to me. How lucky was that? I had been carrying it in my lap and it must’ve fallen out of the wheelchair. My foot is still swollen but seems a better colour today, not quite so inflamed although the skin is dry and flaky. It has been blood red and puffy. 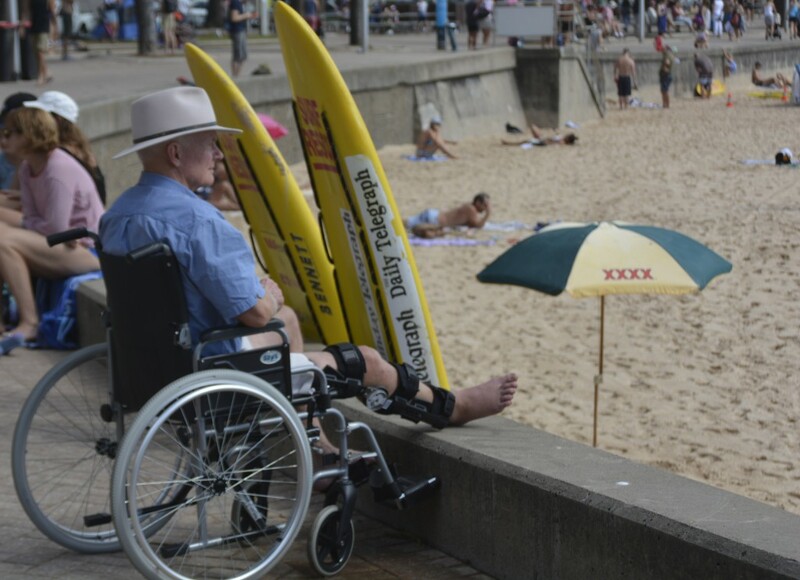 This afternoon I rolled my wheelchair three quarters of the way down to Manly. Didn’t make it the whole way as my shoulders are very sore. This is a very boring time of the recovery process. Nothing seems to happen, nothing changes. 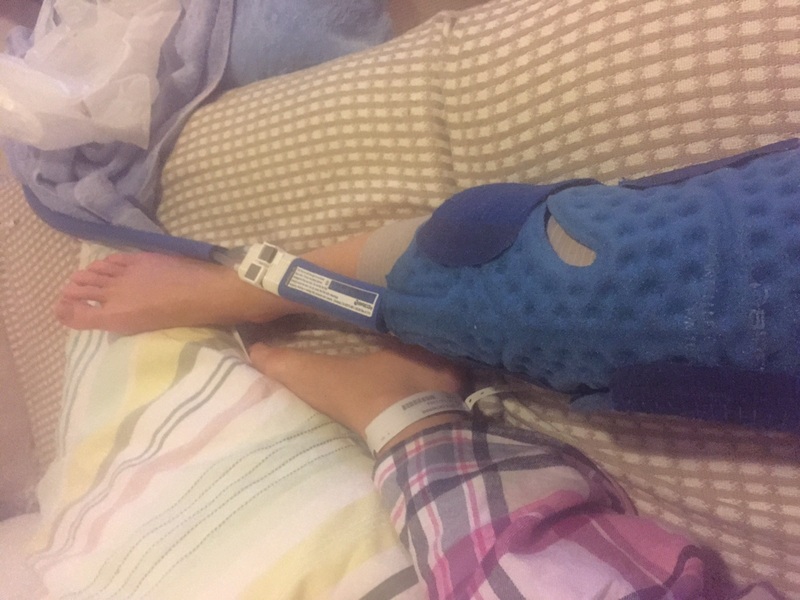 Found out today that my daughter Catherine has to have work done on the meniscus in her right knee, which was damaged when she broke her tibia. This will happen when they take out the plate in her leg. That is disappointing. Apparently this is what has been causing the pain. Two years after surgery and she is still feeling the effects. She doesn’t seem all that bothered. She is stoic and resilient for such a young person. We are sharing the pain. Her courage is an inspiration to me. The Balmoral group asked me to come down and have breakfast with them after their Wednesday swim at Manly. I didn’t feel up to it as I would have had to wheel down in the chair all the way. Also I feel like an impostor as I’m not swimming with everyone else. I felt I would have been imposing. Jan Davies and Meredith Aveling very kindly came and took me to breakfast after the swim anyway. We went to Jellyfish which is just up the street from my apartment. Jan announced at breakfast that she had had a heart attack on the weekend. I was just stunned. She is one of the fittest people I know. No excess weight and really looks after herself. She seemed to take it so well and all my problems pale in comparison with that. My letter to the Japanese Emperor was returned today, marked “Return to Sender.” He never even read it! What an insult after all the effort I made to write it, then get it translated into Japanese. So much for Japanese courtesy! In the evening went to my exploring friend, Andrew Harper’s presentation for Australian Desert Expeditions. As it was a formal presentation I had to wear shoes and the only thing that would fit were boat shoes. My right foot was very sore and swollen, the leg red and inflamed, when I got home. I am aching to get the proper weight bearing recovery under way. I am just marking time.